Not available to existing Sky Fibre customers. New 18 month contracts. Separate contracts apply for TV: £15pm, Broadband Unlimited (including line rental): £18pm and Sky Talk Pay As You Go: £0pm. Sky network areas only. Offer ends 23/04/2019. £33pm offer not available to existing Sky Fibre customers. New 18 month contracts. Separate contracts apply for Sky TV, Sky Broadband and Sky Talk Pay As Go (£0pm). TV standard set up: £20 for new TV customers; £10 admin fee for existing Sky TV customers without Sky Entertainment. Broadband router delivery charge £9.95. Connection/ admin. fee: New broadband customers: £10; Existing Broadband customers: up to £50. Standard prices apply after 18 months: Sky TV: £27pm or £22pm if signing up to a new 18 month minimum term; Sky Broadband Unlimited: £31pm; Sky Fibre Max: £45.99pm. Selected areas only. See sky.com for more details and our Usage Policies. No traffic management policy. External Factors such as internet congestion and home wiring can affect speed. Speeds vary significantly by location. Offer not available with any other offers. Never miss another show, with up to 65 channels all in one place - including Sky Atlantic, BBC iPlayer and ITV Hub. You can even watch the latest shows from the last 30 days. And best of all, it's easy to set up; just connect your compatible Sky box to your broadband router and you're ready to go. Catch great shows live and on demand with Sky Go on your compatible tablet, mobile or laptop - all at no extra cost for Sky TV customers. You can even set your box to record or download a show when you're out and about, so you won't miss a thing. Catch more of your favourites. Record 3 shows, watch a 4th, and store up to 500 hours of TV on our Sky Q 1TB box. The new Sky Q Hub ensures the best Wi-Fi connection and most reliable experience while delivering speeds up to 3x faster than the previous generation of routers. Giving you control over your family's online experience and helping provide protection. Included at no extra cost. Safe Search: Blocks explicit content from search results. Simple to customise: Select what gets through with clear age categories. Works on all devices: including smartphones, tablets and games consoles when connected to your Sky Broadband. Sky VIP is our way of saying thanks for choosing us. Join for free and choose from a range of exclusive rewards – the longer you're with us the better it gets. Download the My Sky app and hit the Sky VIP button on the home screen. There's a Welcome Gift waiting for you and something new every week. Sky Broadband customers can get a free trial of McAfee Internet Security Suite ensuring online safety. Online protection: Stop the latest threats with virus control and shield your Wi-Fi network from unwanted connections. Web advisor: Advice and protection vs. dangerous downloads. Parental controls: Blocks access to harmful content to keep kids safe online. Pay only for the calls you make with Sky Pay As You Talk, or add one of our Talk packages with inclusive calls when you purchase your broadband. All our packages come with line rental included. Our personalised call-screening service lets you answer the calls you want and block the ones you don’t. 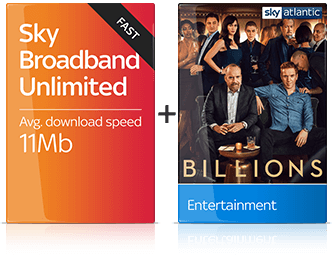 When you have both Sky Entertainment and Sky Broadband, you can consolidate your bills into one, making them easier to manage. Sky Broadband and Fibre turn Sky Q boxes into Wi-Fi hotspots, improving Wi-Fi speed and coverage around your home. Sky named 'The best performing major broadband and TV provider' in the Ofcom Complaints Report Q4 2017. Bringing together fast broadband and calls, the best of TV and now a foray into mobile – Sky has it all. Sky Q Wi-Fi hotspots: can improve speed and coverage in hard to reach areas of your home compared with using a Sky Q router alone. Your wireless speeds cannot exceed the fixed line speed coming into your home. Best performing major provider: Sky received the fewest complaints per 100,000 customers measured by Ofcom comparing Sky, BT, EE, Plusnet, TalkTalk and Virgin Media fixed broadband in its latest Telecoms and Pay TV Complaints Report (September 2017). Even stronger signal: Requires Sky Q box, Sky TV, and Sky Q experience subscriptions and Sky Broadband. Coverage depends on home set-up. When it comes to great entertainment and great kit, we've got it covered. Place your order with Sky. Our Tech Team will talk to your current provider to cancel your contract so you don't have to. Place your order with Sky. Our Tech Team will switch on an inactive line (if you have one) or if you don't, organise an engineer appointment to install a new Sky phone line. Look out for a text message from our Tech Team to remind you about your appointment a couple of days before. Sky has partnered with Devialet, one of the most innovative names in audio to deliver a sound so real, you'll think you're at the heart of the action. With Sky Store, you can watch the biggest blockbusters and Box Sets whenever you want, on your Sky box or online. 1. I don't make calls, why do I need line rental? 2. If I already have an active phone line, do I need to pay for a new one? 3. Can I keep my existing phone number? 4. Will you contact my current provider to cancel on my behalf? 6. When will Sky Fibre be available at my address? Sky Fibre is available to nearly 28 million homes, which means around 95% of the UK can order a broadband service with average download speeds of 36Mb for Sky Fibre Unlimited and 63Mb for Sky Fibre Max. The network is constantly being expanded and upgraded. Use our availability check to find out if Sky Fibre is available in your home. 7. How long will my broadband installation take?